Reedman Toll Auto Group is staking its claim in ride-share vehicle sales and service, a segment still in its infancy but expected to grow and redefine retail automotive, said Daryl Kessler, the group’s vice president. The dealership group’s Langhorne, Pa., campus is home to a new facility and program that caters to ride-share drivers — particularly those who drive for Lyft. The facility has a lounge for ride-share drivers with a second lounge under construction, a 14-vehicle parking area and a VIP service lane specifically for Lyft drivers. Want to drive for Lyft but don’t have a vehicle and either can’t or don’t want to buy one right now? As a short-term solution, Reedman Toll has partnered with StorkDriver PA, an independent rental car company that rents vehicles, complete with insurance, to ride-share drivers. Over the longer term, the dealership group hopes to convert those ride-share vehicle renters into vehicle buyers and snag more service business along the way. Since the program started in November, the dealership group has seen a “steady flow of Lyft drivers and cars” in its service department and lounge, Kessler said. Vehicle sales will come later as the group builds relationships with drivers, he added. “Ride-sharing is here and here to stay,” Kessler said. “We want to be part of the auto industry that makes rental cars available to these drivers if they need them. We want to be part of the industry that sells cars to these drivers if they want to buy them. We want to be part of the industry that services these drivers’ cars. The seven-dealership group sells Chevrolet, Chrysler, Dodge, Jeep, Ram, Fiat, Honda, Nissan and Subaru, at its Langhorne location and elsewhere in the north Philadelphia area. Lyft directs drivers and potential drivers who need vehicles to DriveItAway’s car-sharing platform which connects them with StorkDriver PA if they want to rent a vehicle with insurance or to Reedman Toll if they want to purchase a vehicle. Drivers who rent vehicles are contacted by Reedman Toll to let them know it can help them finance and insure a vehicle when they are ready to purchase. “We try to meet any drivers’ price and size needs to allow them to drive for Lyft in a way that works for them,” Kessler said. DriveItAway president John Possumato said his company’s role is to make it easy for dealers to move into the emerging business of mobility, including vehicle subscriptions, through DriveItAway’s car-sharing platform, while increasing dealers’ traditional sales and service business. But “the low hanging fruit as we see the business right now is adapting for ride-share drivers,” he added. Though ride-share vehicle sales are important, so is the service business ride-sharing generates, said Kessler. According to Possumato, ride-share drivers drive six times more miles than drivers of personally-owned vehicles, creating a more frequent need for oil changes, brake pads and other maintenance. “Maintenance is a big part of the work we’re seeing in the shops,” Kessler said. Reedman Toll is supporting Lyft drivers with special service perks such as four free oil changes, free brake pads for the life of their vehicle after they buy one set of brake pads and a 20-percent discount on all service and maintenance. Additionally, the dealership group has set up a special service lane with its own service manager for Lyft drivers. A wall, painted bright pink to match Lyft’s corporate logo and visible when a driver enters the dealership’s campus, helps direct drivers to the Lyft service lane, Kessler said. All Reedman Toll customers are a “priority”, but because Lyft drivers come to one specific lane for service, the dealership group wants to make sure their vehicles are sent promptly to the right service department, Kessler said. For example, Chevy vehicles are sent to the Chevy service department, and Chrysler vehicles are sent to the Chrysler service department, because those technicians can perform warranty work and are familiar with recalls for their respective brands. However, the group regularly services brands for which it does not operate a franchise, he said. “Lyft drivers are driving for their livelihood, and we want to make sure we can provide them service as efficiently as possible,” he said. To position itself as a “home away from home” for drivers during dealership hours, Reedman Toll has outfitted its showroom lounge with sofas and comfortable chairs where drivers can enjoy complimentary coffee and snacks, watch TV and recharge their cellphones, whether they are there having their vehicle serviced or on a break. The new lounge is scheduled to open in the service department this spring and will be similarly appointed, Kessler said. “Many times drivers on a long shift need a place to stretch their legs, and why not do it with us?” he said. In November, Reedman Toll threw an appreciation party for Lyft drivers to kick off the dealership group’s entry into the ride-share market. Lyft invited current drivers and people who expressed an interest in driving but hadn’t yet committed. The three-hour event included food, music and a $1,000 drawing. Lyft, StorkDriver PA and Reedman Toll representatives were on hand to explain how their respective companies help ride-share drivers become successful and sign up new drivers or renters of ride-share vehicles. “We had about 120 people come,” to the event, Kessler said. “At least 40 of them signed up for service in the future, and about eight had oil changes” during the party. Ride-sharing is a vehicle segment that didn’t exist 10 years ago and had just a modest following five years ago, Kessler said. “Rather than five years from now, and wonder what happened, our thought is why not get ahead of the curve?” he added. Manheim launched its Manheim Express app in 2018, helping dealers list and selling inventory from the palm of their hands. In 2019, the company launched what it describes as an “in-app buyer experience” that helps dealers purchase fresh, local inventory. The Virginia Auto Dealers Association took notice and decided to use the product to help its members gain wholesale efficiencies and make more money. Last month, Manheim Express became an exclusive program partner to help the association and its approximately 450 franchised new car and truck dealers, and the app is now integrated with vAuto’s Provision used-car dealer management software. Dealers can use the Manheim Express app to list vehicles online and use 360-degree imaging with moveable images to highlight damage. The app, which dealers can download for free on Apple and Android devices, helps them receive a “guaranteed first bid” that sets a minimum floor price for a dealer’s vehicle. Manheim will purchase the vehicle at the guaranteed first bid price if the vehicle does not sell for the floor price, or higher, within two sale-days of being listed. Manheim Express also offers a new Concierge service in which a specialist will do all the work for the dealer. The company says that service helps dealers who want the advanced imaging and listing capabilities in the app while being hands-off with the listing process. Manheim vice president of offsite solutions Derek Hansen said in a news release that dealers rely on the Virginia association for advice, guidance and support. “The fact that VADA endorses Manheim Express as a valuable tool for dealers to buy and sell vehicles right from their lots is a testament to the app’s success in fueling greater efficiencies and helping dealers meet their goals,” Hansen said. In addition to selling vehicles, Autotrader team members keep busy with community service, including sponsorships, donations, community partnerships and volunteerism. Now the company is continuing its participation in a program that it launched last fall to raise money for veterans during their road to recovery. Autotrader was set to honor America's heroes with Brad Keselowski's Checkered Flag Foundation during the Monster Energy NASCAR Cup Series race weekend at the Atlanta Motor Speedway Friday through Sunday. Brad Keselowski drove the No. 2 Autotrader Ford Mustang for Team Penske, and he launched the return of the Tribute 2 Veterans program last fall. During the campaign, friends and family of former service members submitted a veteran’s name to be featured on the No. 2 Autotrader Ford Mustang. Cox Automotive, parent company of Autotrader, encouraged current veteran employees from all Cox Enterprises companies to add their names to be placed on the vehicle. The vehicle’s paint scheme features 58 Cox employee names and more than 140 additional veterans. The proceeds go to the Checkered Flag Foundation, and each veteran will receive a piece of the No. 2 Autotrader Ford Mustang displaying his or her name. Autotrader also donated an additional $10,000 to Keselowski’s non-profit foundation, which assists veterans in getting back on their feet. “Our company has a strong tradition of supporting communities, and there is nothing more satisfying than finding a connection between our Autotrader values and our close partnership with Team Penske,” Crowley, vice president of marketing for Autotrader, said in a news release. Now entering its sixth season with Team Penske, Autotrader sponsors Keselowski and fellow driver Joey Logano. The company is also an associate sponsor on both cars for the full Monster Energy NASCAR Cup Series season. 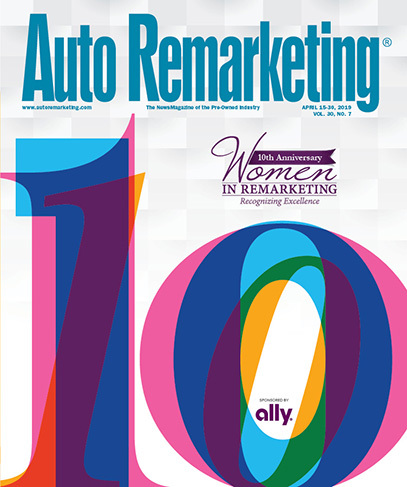 Readers can find more information here on the business intersection of sports and automotive as part of Auto Remarkting's Driving Force series. Holman Automotive likes to talk about its customer lifestyle-focused experience that represents the Holman values. The company is touting the same theme with the recent opening of its new 145,000-square-foot Audi Fort Washington dealership. Holman says the facility features the all-new Audi Terminal Concept, delivering “a lifestyle-focused experience” that also represents those Holman values. The dealership includes four levels of new- and pre-owned vehicles, along with two Quattro Cafes serving premium beverages onsite and a customer lounge with complimentary wi-fi. Indoor and outdoor parking is available. There’s much more. No one enjoys getting a vehicle serviced, but customers might almost look forward to experiencing the maintenance area. The 30 service bays feature three heated, indoor service lanes and private workstations with charging docks. The dealership is also a designated Audi Sport dealer, featuring certified product specialists and a showroom with models such as the Audi R8 and Audi RS 5 Coupe. Holman Automotive also noted that it is transitioning its Audi dealership operations from its Willow Grove location to the new Audi Fort Washington facility. AutoNation will have a new chief executive officer and president on March 11. The retailer announced Friday that current USAA chief operating officer Carl Liebert will replace Mike Jackson in these positions; Jackson will take on the position of executive chairman of the board that same day. “AutoNation is the retail automotive industry leader. The company has a coast-to-coast brand, a comprehensive brand extension strategy and a transformational digital consumer car-buying experience,” said Jackson, currently AutoNation chairman, CEO and president, in a news release. In addition to time as COO and executive vice president at USAA, Liebert’s experience also includes time as the executive vice president for stores at The Home Depot and is a former U.S. Navy Officer. Added Liebert in the news release, “AutoNation has a clear strategy that sets it apart in the auto retail sector and diversifies the typical retail business model. The company’s brand extension strategy has given it an edge in what is a cyclical business.